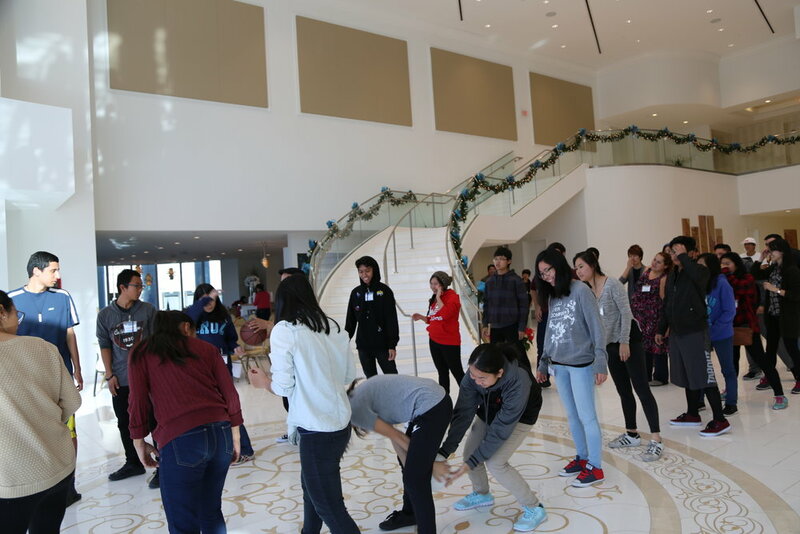 CARP L.A.’s Turning Point Workshop from Dec. 27 – Jan. 1 went exceedingly well, beyond the expectations of even the staff members who participated in building the structure of the program. The schedule did not always occur seamlessly or even include the most invigorating activities, but it accomplished what it was purposed to do and more. 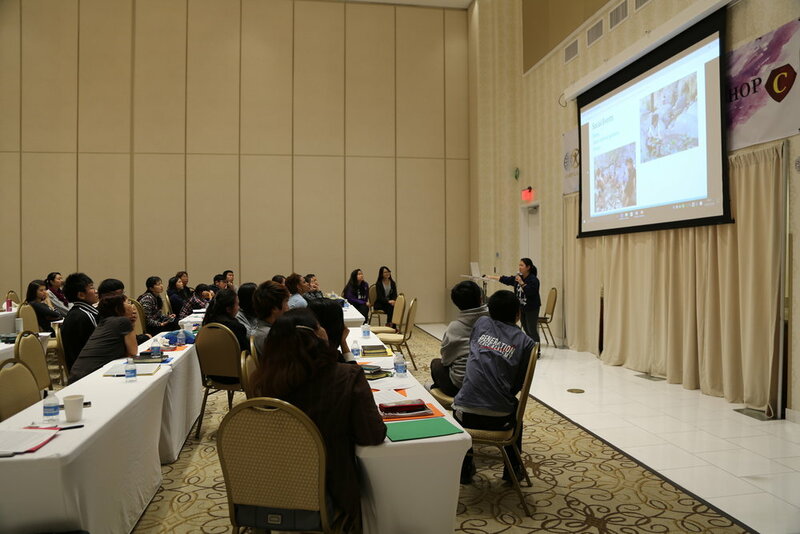 There were 74 participants in total – 31 first generation of college age, 43 second generation (7 high school, 1 middle school, and 4 GPA members) and 7 Kodan mothers. The dates were originally set for January 2nd – 6th, but was later changed due to scheduling conflicts with IPEC. Due to the change in dates, several participants were not able to attend. Subsequently, several relatively newer members were required to step up as team leaders and co-leaders. 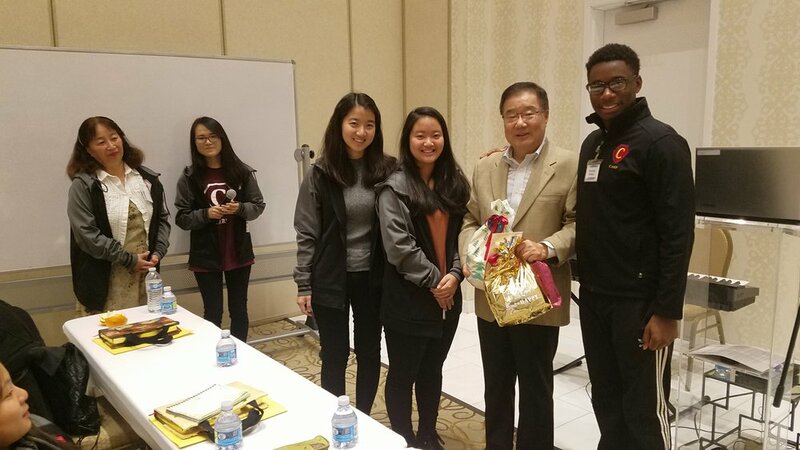 However, to our surprise, the staff members were able to unite relatively quickly because there were not so many seasoned or strongly opinionated leaders there. To educate CARP L.A. Core and Board members. To inspire 1st generation who could not understand God’s heart through reading DP. To encourage 2nd generation students, who do not currently participate in any CARP activities, to initiate CARP activities within their local community and/or universities. To encourage 2nd generation to take more ownership over their life of faith. The start of day one began with Hoon Dok Hwe reading of the three hearts of God and stretching led by Uncle Gerry. The lecture was well received, but because many of the participants did not know each other very well, it was difficult for them to open up towards each other in the beginning. The lectures were very good, and they could really appreciate that at least for themselves. Subsequently, we made the decision to use pair sharing instead of group discussion to encourage participants to be more open. 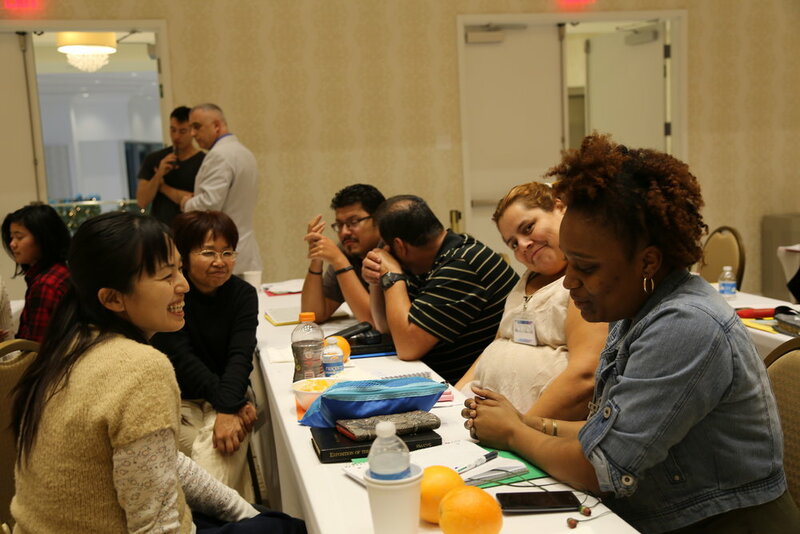 From a team leader’s perspective, it was difficult to wrap my head around the fact that I had to take care of participants who were not totally committed to learning about Divine Principle (DP). I wanted to be surrounded by people who were eager to learn about the DP and True Parents because I came with the intention to be invested in and not to be the investor at the moment. I stayed up until 2 a.m. talking to Naoko and Katsuko as they could convinced me to receive training through growing my heart to take care of others. In this way, I was able to understand True Parents’ heart and God’s heart through my struggle to motivate each member to find inspiration to search for the beauty in what was being taught. 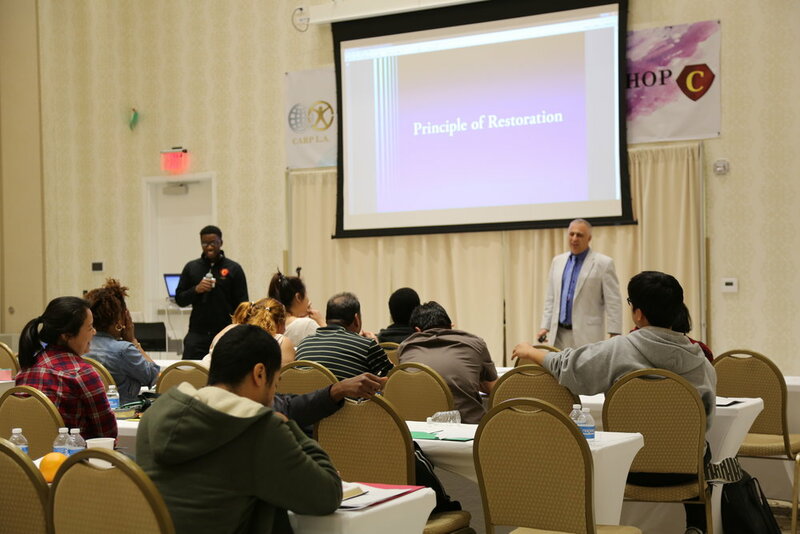 Like the first day, day two began with HDH focused specifically on God’s heart of pain. Because the motivation and understanding was different after a day into the workshop, we were able to really open up towards each other. In my group, specifically, I opened the conversation by sharing a little about my life, and how through certain experiences I could relate to God’s sorrowful heart, even if only a little. From this, each member realized that all of us go through struggles, and while these struggles seem to be all bad, it is an opportunity to understand what our Heavenly Parent has been experiencing for 6,000 years. The activity in the afternoon was a brother and sister discussion session. During this time, we separated by male and female. The brothers broke the ice by playing the chicken game. Afterwards we split into groups of about 4-5 and shared in a guided conversation, which began with shallow questions and later led into more personal ones. Pastor George’s lecture was especially a favorite because of how energetically he portrayed the two topics. Some of the participants thought they would have difficulty staying awake during these lectures but it turned out to be the one they enjoyed most. Also, many participants could see how the events that took place in history are reflected in their own lives and what they could do to overcome some of their problems. Rev. Inose talked to us about a life of prayer. How important prayer is and what is possible through prayer. He also left us with a great deal of material for further research at home about this. Included in this packet was one of Father’s prayers. Many of the younger second generation and newer CARP members found it difficult to break through in prayer, so this talk was one of the most relevant. Others who knew how to pray, but just didn’t, realized that it was important enough to at least set aside two minutes of their day to do so. This lecture was given by Rev. Kevin Thompson. It was such a powerful and well-received lecture because for the first time, many people including myself could hear about True Father in such a personal way. The way the lecture was given painted True Father in a much more realistic and relatable way. I don’t believe one person walked out away from this lecture without a newfound respect for Rev. Sun Myung Moon. Finally, for the Closing Ceremony, the L.A. Band played a few of Hyo Jin Nim’s songs as well as other Holy Songs during dinner and closed out the night. Overall, I believe the workshop was an amazing experience. I was able to experience True Parents heart and God’s heart more intimately than in previous settings, as did many participants. Also, we are eternally grateful to have Teresa (Rischl) there to support us and even to push us to start writing reports for our functions. It was our first time putting together this type of workshop so there were many things we could have done better. Some things we plan to do for our next function is to get advice from CARP HQ on how to organize certain events, have more communication with speakers to build an outline, have each team member type reflections nightly, make an online reflection survey (survey monkey), have brother and sister leaders for each team, develop standards and regulations for team leaders, and finally develop reports such as these during the workshop before most of the details escape me.